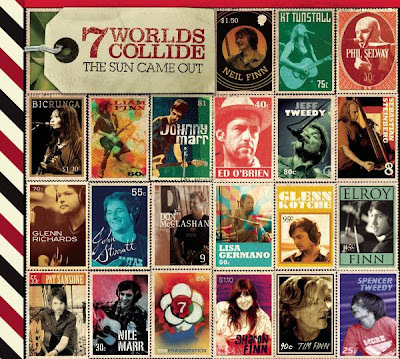 It's seven years ago now that Neil Finn and Johnny Marr hooked up with a cadre of musical stars to produce the 7 Worlds Collide benefit album. On September 29th the 7 Worlds Collide band will return with The Sun Came Out a double album to benefit Oxfam. Finn (Crowded House) and Marr (The Smiths) are joined this time out by Radiohead's Ed O'Brien and Phil Selway to form the nucleus of the band. A rotating cast of musical stars take turns delivering the vocals and pitching in on the arrangements. With that cast of characters, the results on the album are no surprise. Most of the tracks, beginning with the opener "Too Blue", are pop rock gems. Finn and Marr bring their pop sensibility down on nearly every track. When the guest appearances mount we begin to get some greater diversity in the music. KT Tunstall delivers a hauntingly lovely vocal performance on "Black Slick Ribbon" and the peppy "Hazel Black". Multi-instrumentalist Lisa Germano lends her unique strings and vocals to several tracks. Wilco's Jeff Tweedy adds the alt. country touches on "You Never Know" and "What Could Have Been", both of which are stronger than the majority of the material on Wilco (The Album). Taking the album title to heart we get a world-inspired ditty with "3 Worlds Collide". On occasion the music does stray a little too far from the tried and true. Tracks like "Learn To Crawl" are a bit too Radiohead-like to fit comfortably in a package like this. 7 Wolds Collide is also a family affair. Finn brings in his brother and Crowded House partner Tim for "Riding The Wave". Neil's son Liam, who has carved out a nice musical career of his own, wrote and sung "Red Wine Bottle" while Sharon Finn makes an admirable vocal debut on the touching "Little By Little". Neil's other son Elroy provides drums, guitar, and vocals throughout the album. Not to be outdone, Sam Tweedy, and Sonny and Nile Marr also participate. With a line-up like this and a good cause to support, this weighty volume is definitely worth the pick up. Best tracks: "Girl, Make Your Own Mind Up", "All Comedians Suffer"
Funny comment that both "you never know" and Tweedy's other song are stronger than what's on the Wilco album. One of them is???? ?